These amounts may not apply during checkout. You will only pay the shipping costs for the largest / heaviest item in your cart. Other items in your cart are included. 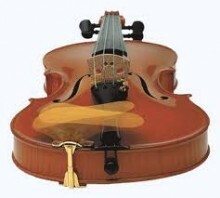 This chin rest is remarkable, allowing for modern playing technique without affecting the individuality of handling the instrument. Its fabrication is compact, yet perfectly elegant indesign.The importance of wood as natural material without varnish is conspicuous, while the precious metal segment is goldplated. It is therefore health-conscious, as the chin piece is in constant touch with the skin. The new chin piece is superb and ideal because it reaches over the tail piece. This way it offers several manners of holding the instrument. It is fixed above the violin block and it could be tightly screwed in. This model of chin piece is definitely going to become popular very soon, as it is suitable for everybody, from complete beginners to leading maestros. THere are four sizes to choose from that alter the height of the chin rest: 24mm, 28mm, 32mm, 35mm. Click the button below to add the SAS Symphony Tiltable Chin Rest to your wish list.